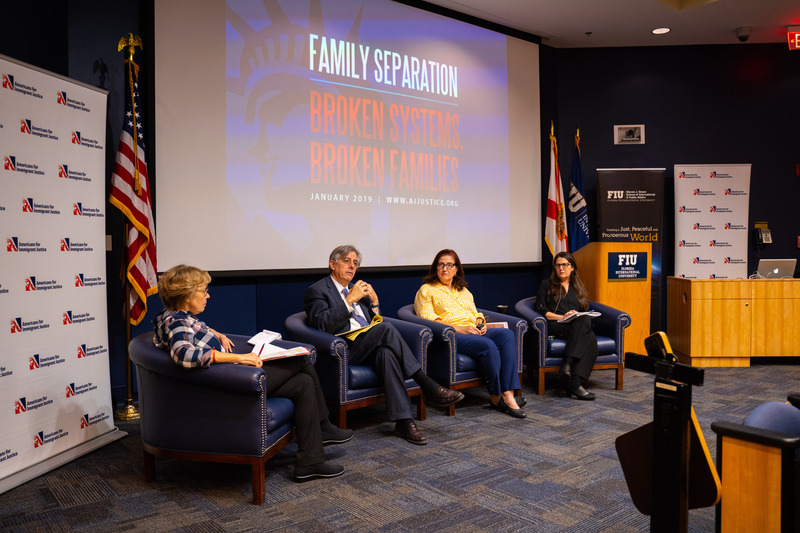 Panelists (left to right: Cheryl Little, Juan Carlos Gómez, Martha Vallejo and Michelle Marie Ortiz) discuss the effects of immigration policies on family separation. For more than two decades, Americans for Immigrant Justice (AI Justice) has fought for the rights of immigrant children who arrive to the United States alone, by providing free legal help and a better life. When immigration policies dominated headlines during the summer of 2017, the non-profit law firm faced one of its biggest challenges: the family separation crisis. The panel included Cheryl Little, co-founder and executive director of AI Justice; Michelle Marie Ortiz, deputy director of AI Justice; Martha Vallejo; a licensed clinical social worker and psychotherapist; and Juan Carlos Gómez, director of FIU College of Law’s Carlos A. Costa Immigration and Human Rights Clinic. Families are separated at the border, whether they enter legally or not. “In fact, many of these families look for border patrol agents to help them when approaching the border,” said Little. The reports affirm that in the last few years, families that have presented themselves at official ports of entry have been turned away, or told that border patrol’s daily quotas have already been met. Little explained the government’s “zero tolerance” policy, announcing that all families crossing the border without inspection should not only be separated, but also charged with a misdemeanor in federal court. With no plan for reunification, children were sent to shelters scattered throughout the United States, while their parents were detained and awaited their court appearance. The separated children were younger than ever seen before. According to Ortiz, children who had most likely suffered trauma back in their home countries were then experiencing perhaps the most traumatic event of their lives. “Most children could not even tell us their parent’s full name,” said Ortiz. There was an entirely different shift in communication and comprehension as the shelters’ staff had to explain to children, young enough to be in diapers, where their parents were. Shelter advocates started communicating with the children through coloring books. Ortiz said this was the only way to get information from them and explain what was happening. Neither the children nor the parents were ever given reliable information. Many of the children at family detention centers reported, “an officer would come tell them it was time for a bath, and they would leave with the officer expecting to see their parents after, but never saw their parents again,” affirmed Ortiz. Customs and Border Protection forcibly separated families and handed the children over to the Office of Refugee Resettlement, but no information about the children was given to the officers. She explained caseworkers faced a lack of information and background on the children, therefore, were unable to help, inform or comfort them. It was later found that Border Patrol agents never recorded any information regarding family units of immigrants at the border. Adversity triggers brain development of children separated from their families. The younger the children, the higher the probability that adversity will impact their lifelong health and mental health. Most of these kids are escaping from community violence, “and when they arrive here, they suffer triple paradigm trauma, which means they suffered in their countries, through the journey and are now suffering here,” said Vallejo. She explained that cortisol and irregular amounts of adrenaline flood the immigrant children’s brains as a result of distress. In these critical developmental stages, children need their parents to buffer stress, release oxytocin through bonding and feel a sense of protection. Policies changed harshly for asylum seekers. One of the greatest barriers for separated families was the fact that former Attorney General Jeff Sessions, who was the head of the immigration court at the time, “is an anti-immigration advocate,” said Gómez. “Resources were stretched thinly to represent people before government agencies,” he affirmed. From a legal standpoint, unrepresented asylum seekers are affected by cultural and language differences as immigration judges often neglect their cases or relate them to domestic violence, gang-related crimes or even terrorist activities, despite clear evidence to the contrary. What does this mean for immigrant children separated from their families? “The machine of deportation is geared up to not help these children and to not give them a fair hearing,” said Gómez. This is a devastating report. Thank you to all of you for the heartbreaking work that you do, and for alerting the rest of us to the horrors that we must stop in this nation. Thank you, FIU, for supporting this essential work of exposing these travesties so we can stand in solidarity to discover how to eradicate these constant attacks against humanity.